That big yellow bus is looking good this morning, isn’t it? I get it. I’ve been there. Heck, I was there last week! Homeschooling isn’t easy and some days you just want to hide in the bathroom and Google public school options in your area. Maybe you’re that parent who’s never wavered or wanted to quit homeschooling? If that’s you, skip to the next post on this site. This one is probably not for you. If you’re a homeschooling parent that struggles with worry or someone who’s not a stranger to homeschooling through hard times, then you’ve probably wanted to quit homeschooling at one point or another on the journey. I wish more homeschooling parents shared their struggles, but the truth is, we all have bad days. Some of us (*ahem*) have super ugly messy hard to recover from bad days. I’m not a doctor or professional, but I think it’s normal to feel like this. Have you ever been unhappy at work before? Co-workers on your nerves? The job seems unrewarding? Feeling unappreciated? Homeschooling is no exception. 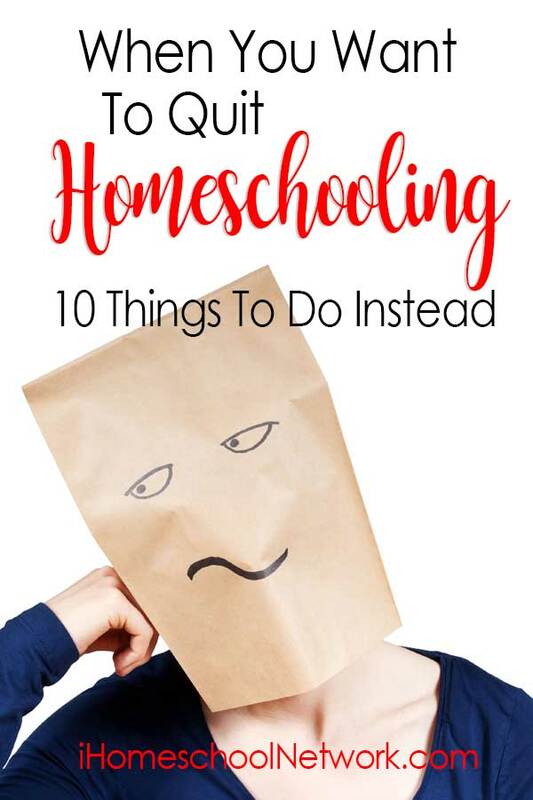 When you want to quit homeschooling, be sure to do these ten things first! Give yourself grace. Know that feeling unhappy at work is nothing new and nothing that won’t pass. Don’t waste time beating yourself up with guilt for feeling like you want to quit homeschooling. It’s hard work! Re-evaluate your mission. Why are you still homeschooling? It’s been eleven years since we started and we’re going through major transitions right now. Our oldest son is in college full-time, commuting five days a week and rarely home. All of a sudden, I have an only child to homeschool and his needs are my number one focus. The reasons why I started homeschooling are much different than why I’m still homeschooling. Sit down and write out a new homeschooling mission statement. Take it one step further and have your kids make one too. Get creative and make a vision board instead of killing your kids with writing. Remember: This too shall pass. Whatever your going through isn’t going to last forever. It’s hard to see the light at the end of the tunnel when you’re in the trenches, but you will make it past this phase! Research other options. Look into the other educational options. If you were to switch to public school, what does that look like for your family? Check out the schools in your area to see if they would be a good fit. Seek out other homeschooling options like co-ops, classes for homeschoolers, or local meet-ups. Many states allow homeschoolers to take public school courses for free. Yes, please! Homeschooling doesn’t have to look one way. You might be encouraged by the resources you find available to homeschoolers after a little bit of clicking around. Phone a friend. It’s so important to have some kind of support system. Talk to your spouse, an understanding friend, or fellow homeschooling parent. If you don’t know anyone in person, find a few blogs to read or join a Facebook group you can count on for real-life encouragement. Whatever you have to do to find some people who “get it”, do it. Knowing you’re not alone in how you’re feeling is sometimes all you need to feel encouraged to keep going. Look in the mirror. Nobody wants to hear this, but…maybe it’s you. Are you doing what you know you should be doing to ensure a healthy mind and body? Do you have a way to reduce stress and get regular breaks from work? Make sure you’re striving to find some balance for yourself. If you’re a homeschooling parent, work is home and home is work and it’s hard to see the difference between the two. Nobody likes a miserable homeschool mom. Set boundaries that allow time for yourself. Start by making sure there is a set time each day when you are off the clock! Plan a workout, take a yoga class, or go for a walk. Binge on Netflix if that’s what you want to do! Just take a break on a regular daily basis. Not just when you want to quit homeschooling! Be honest about how you’re feeling. It’s ok to be frustrated. I’ve learned that homeschooling gets blamed for just about everything when you’re a homeschooling family and the guilt that comes with that is heavy and toxic. Are the kids acting up? It must be because you homeschool them. Parents beat down? That darn homeschooling will kill ‘ya. The reality is, it doesn’t matter where our kids go to school. They are going to have problems and all families will go through hard times. Sometimes making the switch to public school isn’t the answer. It just seems like an easy sensible solution at the time. Wait. Don’t the make a quick decision. One week can make a world of difference. One month can be a game changer. If making a big switch is the right choice for your family, it won’t matter if you do it now, in a few months or even next year. What’s your best advice for when you’re feeling discouraged and think you want to quit homeschooling?